There are four key elements to a great cup of tea. The amount of tea, the amount and quality of water, water temperature, and steeping time. We recommend 2 teaspoons of Blue Mountain Tea Co loose leaf tea per 12 ounce cup. 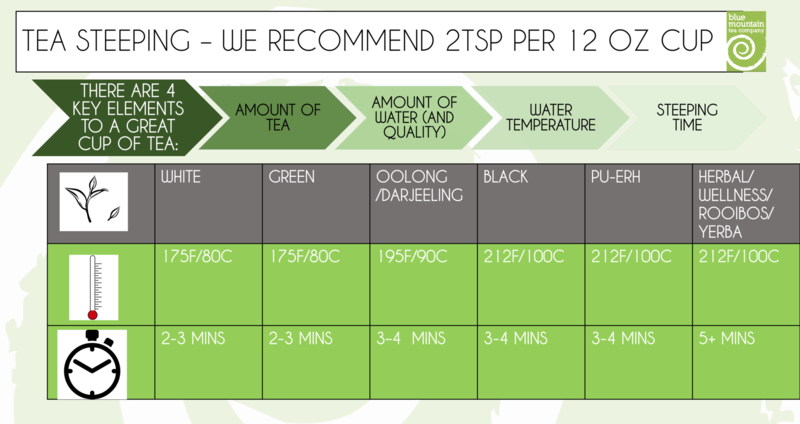 Depending on the blend of tea, depicts which water temperature and for how long to steep the tea for. For example, when brewing a cup of Black Tea, you will steep for 3 minutes, using water which is 195F/90C.